Rep. Jamie Raskin implied Sheldon Adelson influenced the DOJ reversal on the Wire Act, but could not connect the dots in his 5 minutes of floor time. During a House Judiciary Committee hearing to discuss the Mueller investigation with Acting U.S. Attorney General Matthew Whitaker, the high-profile congressional hearing briefly turned to a discussion of online gambling. In particular, a Democrat representative from Maryland asked Matthew Whitaker about his role in the recent reveral of a DOJ opinion on the 1961 Wire Act. Rep. Raskin began by reading a litany of Matthew Whitaker’s business and political dealings over the years: running a daycare center, founding a concrete business, and running for Congress. Of particular interest was Whitaker’s operation of a Washington DC non-profit which collected $1.2 million to $1.3 million in political donations over a 3-year period. The Maryland representative also suggested that the acting attorney general had scammed military veterans of their life savings — a suggestion that Matthew Whitaker took great exception to. After Chairman Jerry Nadler (D-New York) and Ranking Member Doug Collins (R-Georgia) argued over a point-of-order, Jamie Raskin’s questions of Whitaker began in earnest. It was at this point that Rep. Raskin implied that the Department of Justice had been doing Sheldon Adelson’s bidding on the online gambling question. Raskin: What was the title of the non-for-profit? Whitaker: The Foundation for Accountability & Civial Trust [FACTDC]. Raskin: It’s been reported publicity that there was one donor (for FACTDC). As we understand it, I think you were the sole employee of the group. One donor and one employee. Do you know who the donor was to the group that funded your salary for $1.3 million? 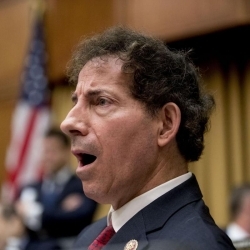 Raskin: Who was the donor? Whitaker: The donor was another non-profit 501c organization called ‘The Donors Trust’. Raskin: Okay, that was the pass-through vehicle, but who reached into their pocket and wrote the check to go through that to pay your salary? At this point, Rep. Jamie Raskin offered his opinion on the donor who paid the bill for the Donors Trust: Sheldon Adelson. Raskin did not make a direct accusation (perhaps due to time constraints), but instead implied the Department of Justice had responded to the GOP’s top political contributor. I’ve got a theory I’m going to float with you and it goes to something strange that’s been happening in the Department of Justice recently. Casino billionaire and magnate Sheldon Adelon hates online gambling, for obvious reasons. It’s competition for him. He wants people in the casinos — not onlline. He spent more than a million dollars lobbying Congress to override a 2011 opinion by the Officer of Legal Counsel (OLC), claiming the Wire Act outlaws online sports gambling, [but] not gambling in the states, which is why Florida, Pennsylvania, New Jersey — lots of states — have built important businesses for themselves online. But Congress wouldn’t change the law according to the demands of Mr. Adelson. So instead of changing the law, he decided to try to get the Department of Justice to change the interpretation of the law. He threw millions into a campaign to make the DOJ get the Office of Legal Counsel to perform a complete reversal and say the Wire Act bans the kinds of lotteries that states run online, even though its language plaintly states it only [bans] sports betting. And when Donald Trump won and Mr. Sessions became AG and you became chief of staff, DOJ’s leadership ordered a reevaluation of this legal question and — what do you know? — the OLC found some subtle and invisible points of law that apparently escaped the DOJ back in 2011. And it reversed the plain reading of the interpretation which talked specifically about sports betting. The congressman from Maryland then asked if Whitaker had ever spoken with Adelson lobbyists about the issue, to which Whitaker said, “No, I have not.” Another question asked about conversations with Charles Cooper, a Washington DC attorney and founder of Cooper & Kirk, PLLC, which represents Jeff Sessions in the Trump-Russia probe. Whitaker said he knows Charles Cooper, but has not discussed online gambling with him. Whitaker ended by briefly discussing the 2011 Illinois white paper on the Wire Act which led to the DOJ’s 2011 opinion on the UIGEA and the Wire Act reversal. Jamie Raskin briefly mentioned Wild Rose Casino Resort, which donated $2700 to Matthew Whitaker’s congressional campaign in Iowa years after the campaign ended.